Candidate for Sheriff Dan Bosley. Giuliano photo. Vin Jensen spoke with Dan Bosley last Monday about his campaign for the office of Sheriff of Berkshire County and about his vision for that office, for the Berkshire County House of Correction (HOC) and its programming and for new levels of involvement and cooperation between the Sheriff’s Department and local and regional agencies in Massachusetts’ westernmost communities. 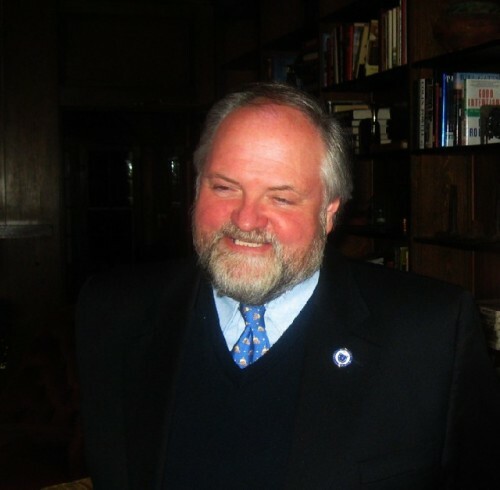 Bosley is opposed in the Democratic Primary (to be held September 14) by Tom Bowler, a Detective and 24-year veteran of the Pittsfield Police Department. Bowler is running on his experience as a law enforcement professional, while Bosley, who has served as a Massachusetts State Representative for the same period of time, insists that the role of Sheriff has evolved in Massachusetts. The Sheriff's mandate, Bosley says, is public safety but the office is no longer a law enforcement position. Since there is no Republican candidate for the office, the Democratic nominee will run unopposed in the general election and will become the first new Sheriff that Berkshire County has had since 1978. Vin Jensen: As a State Rep for some 24 years, you are no stranger to elective office, and while that gives you an advantage in knowing how to get votes, isn’t it also fair to say that it presents one of the biggest challenges of your campaign in terms of communicating to voters what you have to bring to the office of Sheriff? My message has to be more complicated than that . The job of the Sherrif is not a law enforcement job. The Sheriff is responsible for the care, custody and condition of inmates. You can take a broad or a narrow interpretation of that, but either one is public safety, not law enforcement. The Sheriff does not go out busting perps, he doesn’t go on stakeouts. The perception is that he’s Wyatt Earp or James Arness in the wild West. That’s what people think, but that’s not what the job is. It’s evolved into an administrative job—running the House of Correction. You need budget experience, you have to have administrative experience. You have to be a social worker, a mediator, a teacher. The House of Correction is one of the biggest educational facilities in the county and one of the biggest health care facilities in the county, because you are charged with the care, custody and condition of those people. So you need administrative expertise. At any one time you’ve got 350-400 people who are dependent on the county for everything. It takes someone who knows how to write grants. It takes someone who knows people in Boston and Washington, because you deal with state and federal government. It’s not law enforcement, it’s public safety. Every Sheriff is a little different. Each one runs programs based on what he knows. Our present Sheriff was a teacher. He runs some pretty progressive educational programs at the House of Correction. He also developed the Juvenile Resource Center, which is sort of an alternative school for people who are sentenced there or are troubled at other schools and need a little more discipline, more regimentation. It’s a signature piece. He also runs the Underwater Rescue Team. He’s in charge of County Communications. He does some traffic control for special events at places like Tanglewood. He’s a member of Triad, a group that ensures the safety of our seniors. He runs the Child Project, which performs iris scans for identification purposes. And the list goes on. There are a lot of things that the Sheriff gets into, and you have to be able to multi-task, you have to have some background in all of that. That’s more my background than it is that of a law enforcement officer. Jensen: Are you planning to leave all of those programs in place, if elected? Do you plan any enhancements, changes or additions to those programs? Bosley: Yeah, I think we’ll leave most of them in place. The Sheriff we have now runs some very good programs. The problem is the Sheriff’s budget has declined by about 14% over the last two years as we’ve gone through the worst recession in 70 years. So you have to fit all of those programs into a smaller box these days. The job in three words is: security, rehabilitation and re-entry. We can argue about the efficacy of putting people in jail for victimless crimes, but you still have to run a secure facility, and that’s getting tougher all the time, because we have more gang-related violence in Berkshire County than we had 20 or 30 years ago. But I believe that if you really want to keep people safe, and if you want to do that within a budget, then you have to talk about rehabilitation and re-entry. Rehabilitation means that the day that an individual walks into the facility, we need to start preparing them for the day they walk out. The longest sentence at the House of Corrections is 2 ½ years. If you have a longer sentence, you go to a state facility. So we get a lot of alcohol and substance abusers. The demographic is not as well educated as the general population, so it’s important in rehabilitation to fill in whatever those holes are in their lives, because we need to bring them back as better citizens than when they went in. However, the average time served in a House of Correction is only 9 months, and that’s not long enough to rehabilitate someone. That’s why the third part of the job is so important. Re-entry. As part of the responsibility for care, custody and condition, we need to follow people back into the community with programs that blend in with the programs that we have. If you or I had a learning disability, there are probably a dozen programs we could find in Berkshire County that would address that. When you go into the House of Correction, you take the House of Correction programs. We need to integrate more of those programs, or when you leave, we need to hand you off to those other agencies. If we can give you more responsibility and have you take a little ownership in the community, you’re not going to reoffend—or a smaller percentage will reoffend. A lot of the programs at the jail are very good, but they’re not enough. We don’t have enough money, we don’t have enough resources, and we don’t hand off as well as we should. So I think that there are more things that we can do. And again, that’s part of my skill set. I started the state-funded Adult Education Network in 1993. I’ve been on the Mass Jobs Council. I know job training programs. I’ve worked with the Berkshire County Community Coalition; I was one of the founding members up here in North Berkshire County. So those are the abilities and the knowledge that I can bring to bear on and to enhance the services that we already have at the House of Correction. Jensen: Given the kind of follow up that you envision—the handing off of released offenders to other agencies in the community—will that vision require any statutory changes? Bosley: No. Chapter 37 is pretty wide open. Sheriffs generally make the job in their own images. We have social workers who are now sheriffs; they tend to take on the characteristics of a social worker. Some sheriffs were probation officers, some were teachers; they tend to take those characteristics on. So there’s a lot of play in the law, a lot of interpretation as to what “care, custody and condition” means. Jensen: Which social service agencies do you see as playing key roles? Bosley: Oh, heck! All of them! The vast majority of the prisoners in our House of Correction come from our community, and most of them will go back into our community, so they should be able to take advantage of the whole panoply of services that we have. Soldier On is very important in dealing with homeless veterans, and veterans released from the HOC should be handed off to them, or we should work in cooperation with them. Berkshire Housing. The colleges. Some HOCs around the state have internship programs with community colleges to try to get more people involved and volunteering. The easiest way to make people better citizens is to have them participate. I don’t care whether you’re an inmate or not; that should hold true for everybody. So we have a lot existing services, and if we can integrate them into the HOC, so that it becomes part of the larger community, people will take ownership and become better citizens. If you participate in social activities or in groups within your community, you get more involved. So we need to get more involved and take some of the mystery out of this and make it more transparent. Bosley: (Laughs.) Oh! Shining, happy people everywhere! Jensen: Well, yes! But what I mean is: What does the path through that network of social services look like in order for that inmate to get established and to be able to participate in the community? Bosley: If you take a look at the demographics—at who’s in the HOC—it’s mostly male, between the ages of 22 and 32. A lot of substance abuse problems and an educational level that’s below high school. So we need to get them up to high school, give them some education and some aspirations. One of the things that we’ve done in the House of Representatives—over the last couple of months, we passed a crime bill. There are pieces of that bill that give the Sheriffs discretion with regard to non-violent offenders, to put more people out on electronic monitoring, with day reporting rather than being housed in jail. That’s significant, because it costs about $2500 on average around the state to keep someone on an electronic monitor. It’s about $43,000 if we house them in jail for the year. So we save some money. But it’s also important because it gets them back into the community, back into a more normal life. Rather than opening the door and saying, “Here’s your re-entry plan. See you later! Call if you have any problems!” what we’d do is say, “Let’s continue to follow you. We’ll check in every once in a while. We’ll make sure that we coordinate services, and we’ll get you more involved in the community.” So five years on, they’d be much farther along, and hopefully we’ll have a lot fewer people reoffending. Jensen: In last Tuesday’s debate, you said that the academy at the HOC (where Correctional Officers are trained) could be used to provide training to other segments of the community. Could you give specific examples of the kinds of training that might be offered there? Bosley: We just passed a law called Silver Alert. It’s like Amber Alert, except that when a child is kidnapped, you do a state-wide alert. A Silver Alert is for seniors with dimentia. There are about 220,000 people in Massachusetts who have Alzheimers or some form of dimentia, and 60% of them walk away from their homes at some point during that dimentia. Unlike an Amber Alert, where somebody has kidnapped a child and is trying to get away, most seniors stay very close to home and burrow in. So we passed a bill saying that we need to train local officials, and our community call centers need to be trained, to put out a “reverse call” to the neighborhoods around the house before somebody burrows in or hides because they want to feel safe. Since the Sheriff is a member of Triad, which is designed to ensure safety for seniors, and since the Sheriff runs County Communications, I issued a press release saying we should train our emergencey personnel in what it takes to find people with dimentia. We have a secure facility. We already operate most of what whould happen when we implement a Silver Alert. So how do we take something like that and make it better? We do that through training. Since we already train Correction Officers, let’s find a way to make that pay by doing training less expensively than is happening now. We’v had grants over the past few years for training volunteer firefighters. Let’s train them in one facility, so we can get a lot more people than by going from town to town. We can save money for cities and towns, we can save money for the state, and at the same time, create a little more revenue for ourselves. If you take a look at the budget, we’re always subject to the vagaries of the state budget. When we have a good year at the state level, the Sheriff’s Office has a good year; when you have a bad year, the Sheriff’s Office has a bad year. I’m trying to find ways to generate revenue so that I can fill in the bumps. So we throw out ideas, and each one is a piece of a much larger plan to help us smooth out the rough edges in our budget. Jensen: Your campaign slogan is “Ready Day One,” and you’ve said a lot about your readiness to take office. What does day one look like? What would be your first priority? What do you want to take on first? Bosley: The first priority—going back to direct supervision—is bringing everybody in, so the first couple of days would be spent explaining what my vision of the job is. The Correction Officers are important, but they’re less than half of the employees in the HOC. There’s maintenace, education, and communication personnel, tech people, a locksmith (pretty important in a jail! ), and all of us have to be on the same page. My leadership style has always been that I have enough self-confidence that I don’t think I have to control everything, so it’s getting everybody on board as to what I expect. That would be the first couple of days. Then I think we would take some of the low-hanging fruit like the Silver Alert reverse calling for seniors. We could do a help line here at the County Communication Center. That’s the kind of thing that we can implement right away. Changing intake and assessment, so that it becomes more comprehensive. Some of the other pieces, like a regional lock-up facility—well, we have to wait until we get the money from the state to build the facility before we can implement it, but we can put it in motion right away. And there’s a lot that I probably don’t know. You’re not supposed to admit that when you’re running for office. But there’s a lot that I do know about that office, because I’ve been dealing with the Sheriff for over 24 years—when I was a City Councilor, when I was on the County Advisory Board. I was actively involved when the Sheriff was building the HOC, and I’ve been down there numerous times. So I understand it, and I also understand that, immediately upon taking office—probably after September 14th, because the primary is really the election—the first thing to be done is, and I’ve been saying this--you can’t do anything if you don’t have a budget. So the first thing I would use is my relationships with people in Boston to start to lay the groundwork for next year’s budget. I think that’s job one. And then the day that I walk through the door, hopefully, we’ll be advanced on that and we can start to do some things to change some programs and add to them. Jensen: Tom Bowler has claimed the endorsement of the International Brotherhood of Correctional Officers, the union representing Correctional Officers at the HOC. Since votes are cast one at a time, what case would you make for why Correction Officers and other HOC employees would benefit by serving under you? Bosley: I think in the debate the other day, that became very apparent, and it becomes more apparent every day. I’ve issued, I think, a dozen press releases over the past six weeks, detailing parts of my plan. Part of that plan is budgetary. My opponent has not issued any—well, he issued one press release, saying he wasn’t going to propose anything until he goes in and does a top to bottom review and learns the job. I don’t know why in the world anyone would want to run for something if they don’t have any aspirations as to what they want to do once they get in. But that, apparently, is his campaign strategy. I have the ability to go in and I do know the job, and part of that ability is budgeting. I wish that I’d had the opportunity to talk to the Correction Officers before they voted in the Spring. I didn’t have that opportunity. The union leadership interviewed me, and they said, “We’ll put this in our own words.” I found out later that’s not exactly what happened. So I wish I’d had the opportunity to explain to them that, if you want to be safe, if you want to be secure, you’ve got to be fully staffed. And there’s only one out of the two of us who know our way around a budget, and as I say, that becomes more apparent every day. Only one out of the two of us has dealt with Boston. I thought that Tom Bowler did a nice job Tuesday night at the debate up here, but he started off saying that he’s uncomfortable with public speaking and that I would probably be uncomfortable interrogating a murder suspect. Well, whether I would or I wouldn’t, it’s immaterial to the job. But public speaking is extremely important in the job. The ability to communicate to the Senate Ways and Means Committee, to the Governor’s Office, and the ability to negotiate contracts—all of that is important to this job. So if you want somebody that’s got a proven record of leadership and knows his way around a budget, well, that’s me. This job is also the last vestige of county governement, along with the District Attorney. As one of the last county officials, there’s a lot of responsibility, so it’s a lot about accountability and being able to lead and to think on your feet. So the question is, who has leadership ability? Who’s able to take initiative? In my career as a legislator, I’ve taken leadership roles in several areas--life sciences, culture and the arts, economic development, education. I’ve been chairman of three pretty powerful committees and over the course of 24 years have received 28 Legislator of the Year and Lifetime Acheivement Awards for the work I’ve done, mostly for leadership in the Legislature. I’ve received two fellowships and an honorary doctorate for legislation. So what qualifies me is proven leadership.